Last month I wrote yet again about the national scandal of Indeterminate Sentences “for Public Protection”, or IPPs. Long after IPPs have been abolished and can no longer be imposed, literally thousands of people who were given IPP sentences before abolition are still in what amounts to preventive detention in the harshly punitive conditions of our prisons. The majority of them have completed the punishment part of their sentences and are now warehoused behind bars because men (and women) in suits are frightened that if released they might re-offend. The criteria for agreeing to release them are so Kafkaesque, so heavily weighted against even the most innocuous IPP prisoner, that those still incarcerated and their families begin to fear that they will never be released. Parliament has given the Justice Secretary (the government minister responsible) powers to reform the criteria for releasing IPPs unless they clearly pose a serious threat to public safety, but the Justice Secretary refuses to exercise them. Those concerned about this monstrous situation should watch the BBC2 television programme Newsnight tomorrow, starting at 10:30pm on Thursday, 13 March. Watch it live on television or on your PC or laptop, live or later. Please record it if you can and ask your friends round to watch it later. Then persuade them to write furiously angry letters to their MPs — again — demanding long overdue action to remedy this grotesque injustice by the man now responsible for it: Mr Chris Grayling, the Tory Secretary of State for Justice. Justice! 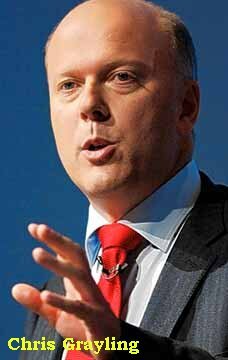 Chris Grayling is not suitable for the job he has been given he shows no interest in this IPP sentence, its more of an inconvenience to him to even look into the sentence I feel he should stand down and get somebody that has some compassion for the job. I will be watching news night with interest. Brian writes: Thank you. I’m afraid that as the general election approaches, the prime minister and his present Justice Secretary are more interested in demonstrating that they are “tough on crime” (and on criminals) than in removing injustice, which they believe, probably rightly, doesn’t win as many votes and doesn’t win Brownie points with the Tory back-bench MPs. That’s why the enlightened, liberal Ken Clarke was sacked and a hard-line illiberal right-winger was selected to succeed him. What a tragedy. Newsnight was very interesting last night and I thank the team for bringing things to light again. I have always believed the sentence was ill thought out (saying this politely) and Mr Blunkett knew this from the start, will this interview help the IPP hostages we will have to wait and see. Its about time Chris Grayling got off his bum and looked it this properly. Hello Brian, yes, I agree with Wendi. The important thing is to keep this situation on the public agenda, and yesterday’s Newsnight helped do this, so we are grateful. However, so many unanswered questions still remain. It is alright saying that in future, more will be done to ensure people do the courses before the expiration of tariffs, but what about all those thousands years beyond tariff, who have already done every course available? And no mention was made of the Government’s power to change the release test, which would definitely help with the backlog. Brian writes: Thank you, Helen. I agree that Mr Grayling’s refusal to exercise the power given him by parliament to reform the release criteria didn’t emerge clearly from the Newsnight programme although it was referred to obliquely towards the end. I imagine that Zoe Conway, who made and presented the main film in the IPPs segment, and Emily Maitlis, who interviewed Crispin Blunt after it, had decided that if the programme overloaded viewers with rather complicated technical questions like this, they would lose them and the main message would not get across. Despite this partial omission I thought Ms Conway and Ms Maitlis did an excellent job in bringing the whole issue to public attention in a way that was both informative and moving. And a warm Bravo to the Newsnight editor, Ian Katz, for giving this part of the programme plenty of time to cover the matter reasonably fully. A good time now for maximum pressure on Chris Grayling to change the release criteria in the way the legislation approved by parliament clearly expects him to do. I feel that David Blunkett,s regret have come years too late he has sat back since 2005 and done sod all to amend the situation he has put the IPP,s in, would he have said anything if they hadn’t ask him for an interview. Brian writes: Thank you for this, Wendi. I hold absolutely no brief for Mr Blunkett, but to be fair to him, he didn’t have to agree to be interviewed, and having agreed to the interview, he didn’t have to accept any part of the blame for the disastrous way the IPP régime worked out. He’s a proud man, politicians hate to apologise because they know their political adversaries will exploit any admission of error, so he was brave to speak as he did. AFAIK he is the only one of the many New Labour home secretaries to have publicly accepted responsibility for what happened, when all of them without exception are to blame for their failure, when in office, to abolish what was increasingly obviously a poisonous stain on our system of justice. Jack Straw, when home secretary, made some relatively marginal improvements to the IPP system, but what was manifestly needed was to abolish it. It’s a stain on the Labour governments’ records that they allowed this monstrous injustice to continue until it fell to a more enlightened, more liberal Conservative Justice Secretary to slay it. The subject that that nobody writes about is the ten year licence conditions on release do you think this is fair? Brian writes: No, I don’t, but even being out on licence on demanding conditions must be better than being kept behind bars for years on end. Surely the priority now is to get the releases of post-tariff IPPs speeded up, ideally by reforming the release criteria? Challenging the length of time on licence and licence conditions seems to me important and worth-while, but at the moment probably secondary. So glad you raised this. A couple of belated comments. I thought Crispin Blunt had a good tale to tell on Newsnight – although it would have carried more weight if the government had spoken for themselves. As for further action, getting Chris Grayling to reform the release criteria is a long hope. There is, however, another key issue on which pressure may be effective: ensuring that prisoners get their programmes before facing a Parole Board. I intend to write to my MP about this. It’s ironic that it should have taken an old-fashioned Conservative to grasp the IPP nettle. Much as I admire Ken Clarke, his record as Justice Secretary is nevertheless mixed. We mustn’t let politicians off the hook. I thought your indulgence of David Blunkett was misplaced. Could you say a few more words about what is involved in “ensuring that prisoners get their programmes before facing a Parole Board”? Perhaps you could put a copy of your letter about this to your MP in a comment here, assuming that you will spell it out in your letter? The rest of us could then use it as a model for writing similarly to our own MPs too. Here is what I sent. Not a template, because I am concentrating on a narrow front. It is, I agree, disappointing that Grayling is not tackling criteria. But IF resources are being provided – and IF the prison management is getting prisoners forward in good order – and IF ministerial interference with the Parole Board is a thing of the past . . . then, just possibly, criteria can be left to wither on the vine. I am concerned at the slow progress in deciding the fate of prisoners who received the now abolished IPP sentence. This is not a new problem – or a theoretical one. It became apparent at an early stage that there were bottlenecks in IPP release procedures; and that these were caused, at least in part, by failures by the National Offender Management Service to get IPP prisoners before the Parole Board with their sentence plans completed. In many cases it appears that this included failure to provide prisoners with the offending behaviour and education courses envisaged in their plans. Given the strict criteria the Board was – and still is – required to apply, prisoners in this position are said to find it extremely difficult, if not impossible, to obtain release (on license) on completion of their tariff, whatever the merits of their case. This in turn seems to have been a major contributing factor to clogging up the system, with prisoners still held as much as ten years after their tariff expired, a figure which I am sure you must find shocking. Part of the trouble has been lack of resources. Be that as it may, the government, after court action, has accepted that remedial action must be taken. 1. How many prisoners appeared before the Parole Board with their programmes NOT completed? 2. Of these, how many were released on license? 3. How many prisoners appeared before a Board with their programmes completed? 4. Of these, how many were released? 5. What, if any, is the overall trend? Would you please be prepared to ask the Ministry of Justice for this information, in whatever form is easiest for them? Simon Hughes might be the minister to approach, as we seem to need someone to look at this problem with fresh eyes. Brian writes: Thank you very much indeed for this most helpful text. My inclination is to write to my own MP along similar lines, perhaps in slightly less detail on the subject of IPP prisoners’ sentence plans, but prefaced by a strong condemnation of the Justice Secretary’s inexplicable refusal, on plainly flawed grounds, to exercise the powers given to him by parliamentary statute to reform the existing manifestly counter-productive criteria for release. As my MP is also the shadow justice secretary I would add a plea that if Grayling persists in refusing to reform the criteria, Labour should promise to do so very soon indeed after taking office after the general election next year (if it does!). I think this should still be the primary thrust of pressures on Grayling and his junior ministers, including the Liberal Democrat (and humane) Simon Hughes, reinforced by the argument about prisoners’ plans. Brian, I feel about Grayling roughly as you feel about Blunkett. In fact I’d prefer to aim a kick at his shins rather than at an innocent guide dog. Nevertheless I have a gut feeling that drawing his attention to this subject is going to be counter-productive. We know he’s not going to change the criteria. He might be tempted to toughen them up, or tell the Parole Board not to go soft, or even to relax the department’s pressure on the offender management service (which, according to Crispin Blunt, is proving effective). This last consideration is the bit I want to check on – the more so, having seen Wendi’s comment. If you are going to go for the criteria, though, there is a possible abuse which your MP might be prepared to take on: what used to be called “Mission Creep.” This is a tricky subject and I may well have got it wrong; but it seems to me that the criteria are in fact quite tightly drawn, aimed, that is to say, only at the most genuinely dangerous and intractable offenders. What seems to have happened in practice is that the Police, and then the Courts, interpreted their powers too widely. Then, to make matters worse, the Parole Board didn’t dare risk ministerial wrath by applying the law more accurately. So it might well help if, in a consensual way, an influential spokesman like your MP were to assure Hughes (yes, him again I would suggest, not Graylng) that he would have Labour support if he encouraged the Parole Board to reexamine the way they have been interpreting their remit. I’m not sure about election promises. Everyone is giving them in Scotland at the moment. Trouble is, nobody believes them. Brian writes: Thank you for this. I agree that nothing any of us can do will persuade Grayling to liberalise the release criteria, but I think it’s still worthwhile to do what we can to publicise his refusal to do what parliament clearly expected him to do and to expose the absurdity of his excuse for not doing it. Not only is there a general public interest in exposing a cruel and reactionary minister: the greater the pressure on him to do what he ought to do, the greater the likelihood that a new government in just over a year’s time, which I hope will be Labour or Labour-led, will be open to persuasion to do what’s obviously necessary. I’m not convinced that returning to the original release criteria before they hardened with mission creep would do any good, even if it were possible. I’m afraid they are inherently flawed under any interpretation. On the most liberal possible reading, they require the IPP prisoner to convince the parole board that he has reformed and is not going to re-offend if released (which is a virtual impossibility), whereas the onus should manifestly be on the parole board to give a concrete reason why a prisoner who has served his tariff should not be released. That is the change that Ken Clarke argued for when Justice Secretary and that’s the reform that we should be pressing for — in my opinion, anyway. I would also favour explicit guidance to the parole boards from the MoJ that the default position should be that a post-tariff prisoner must be released unless there’s a specified reason to suppose that his release would pose “a serious risk” to the public, and that while the prisoner’s record of completing relevant courses while in prison may be taken into account, failure or inability to complete the courses prescribed for him must not not be taken as a reason on its own for turning down his application for release. On balance you may well be right, if only because a consensual approach, especially on law and order, is the last thing any self respecting politician is likely to consider realistic. I agree that having to prove one’s innocence opens the door to tyranny. The Labour Party as much as any other needs to confront this.